Managers alone cannot control costs. An organization is composed of many individuals whose attitudes and efforts should help determine how an organization’s costs can be controlled. Cost control is a continual process that requires the support of all employees at all times. Below graph provides a general planning and control model. As shown in this graph, control is part of a management cycle that begins with planning. Without first preparing plans for the organization, control cannot be achieved because no operational targets and objectives have been established. The planning phase establishes performance targets that become the inputs to the control phase. The next graph depicts a more specific model for controlling costs. A good control system encompasses not only the functions shown in the graph, but also the ideas about cost consciousness shown in the graph. 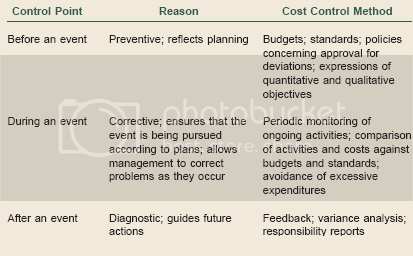 Cost consciousness refers to a companywide employee attitude toward the topics of cost understanding, cost containment, cost avoidance, and cost reduction. Each of these topics is important at a different stage of control (will be discussed after the “Cost Understanding” section below). Costs may change from previous periods or differ from budget expectations for many reasons. Some costs change because of their underlying behavior. Total variable or mixed cost increases or decreases with, respectively, increases or decreases in activity. 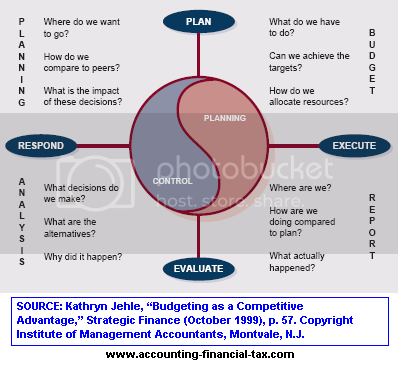 If the current period’s actual activity differs from a prior period’s or the budgeted activity level, total actual variable or mixed cost will differ from that of the prior period or of the budget. A flexible budget can compensate for such differences by providing expected costs at any activity level. By using a flexible budget, managers can then make valid budget-to-actual cost comparisons to determine whether costs were properly controlled. In addition to the reactions of variable and mixed costs to changes in activity, other factors such as inflation/deflation, supply/supplier cost adjustments, and quantity purchased can cause costs to differ from those of prior periods or the budget. In considering these factors, remember that an external price becomes an internal cost when a good or service is acquired. Fluctuations in the value of money are called general price-level changes. When the general price level changes, the prices of goods and services also change. If all other factors are constant, general price-level changes affect almost all prices approximately equally and in the same direction. Thus, a company having office supplies expense of $10,000 in 2008 would expect to have approximately $41,300 of office supplies expense in 2009, for the same basic “package” of supplies. Inflation indexes by industry or commodity can be examined to obtain more accurate information about inflation effects on prices of particular inputs, e.g., paper products. Some companies include price-escalation clauses in sales contracts to cover the inflation occurring from order to delivery. Such escalators are especially prevalent in industries having production activities that require substantial time. The relationship between the availability of a good or service and the demand for that item affects its selling price. If supply is low but demand is high, the selling price of the item increases. The higher price often stimulates greater production, which, in turn, increases supply. In contrast, if demand falls but supply remains constant, the price falls. This reduced price should motivate lower production, which lowers supply. Therefore, price is consistently and circularly influenced by the relationship of supply and demand. Price changes resulting from independent causes are specific price-level changes, and these may move in the same or opposite direction as a general price-level change. To Illustrate, gasoline prices soared in the spring of 1996 because of two supply related factors. The first factor was a harsh winter that caused refineries to reduce gasoline production so as to increase heating oil production. Second, several refineries had problems that caused shutdowns, which also reduced supply in the third week of April from 7.5 million barrels a day to 7.29 million barrels a day. Specific price-level changes may also be caused by advances in technology. As a general rule, as suppliers advance the technology of producing a good or performing a service, its cost to producing firms declines. Assuming competitive market conditions, such cost declines are often passed along to consumers of that product or service in the form of lower selling prices. Consider: You receive one of those little greeting cards that plays ‘Happy Birthday’ when you open it. Casually toss it into the trash, and you’ve just discarded more computer processing power than existed in the entire world before 1950. This is a simple example of the interaction of increasing technology and decreasing selling prices and costs. Alternatively, when suppliers incur additional production or performance costs, they typically pass such increases on to their customers as part of specific price level changes. Such costs may be within or outside the control of the supplier. For example, an increase in fuel prices in the first half of 2000 caused the prices of many products and services to rise—especially those having a high freight or energy content. The quantity of suppliers of a product or service can also affect selling prices. As the number of suppliers increases in a competitive environment, price tends to fall. Likewise, a reduction in the number of suppliers will, all else remaining equal, cause prices to increase. A change in the number of suppliers is not the same as a change in the quantity of supply. If the supply of an item is large, one normally expects a low price; however, if there is only one supplier, the price can remain high because of supplier control. Sometimes, cost increases are caused by increases in taxes or regulatory requirements. For example, paper manufacturers are continually faced with more stringent clean air, clean water, and safety legislation. Complying with these regulations increases costs for paper companies. The companies can (1) pass along the costs as price increases to maintain the same income level, (2) decrease other costs to maintain the same income level, or (3) experience a decline in net income. Firms are normally given quantity discounts, up to some maximum level, when they make purchases in bulk. Therefore, a cost per unit may change because quantities are purchased in lot sizes differing from those of previous periods or those projected. Involvement in group purchasing arrangements can make quantity discounts easier to obtain. Navigate: The preceding reasons indicate why costs change. Next, the discussion addresses actions firms can take to control costs. To the extent possible, period-by-period increases in per-unit variable and total fixed costs should be minimized through a process of cost containment. Cost containment is not possible for inflation adjustments, tax and regulatory changes, and supply and demand adjustments because these forces occur outside the organization. Japanese companies may not have the same view of supply-chain cost containment techniques. In some circumstances, a significant exchange of information occurs among members of the supply chain, and members of one organization may actually be involved in activities designed to reduce costs of another organization. Example: Citizen Watch Company has long set target cost reductions for external suppliers. If suppliers could not meet the target, they would be assisted by Citizen engineers in efforts to meet the target the following year. In the United States, some inter-organizational arrangements of this kind do exist. For instance, an agreement between Baxter International (a hospital supply company) and BJC Health System allowed Baxter access to BJC’s hospital computer information database. The information obtained was used by Baxter “to measure more precisely the types of procedures conducted and the exact amount of supplies needed”. However, costs that rise because of reduced supplier competition, seasonality, and quantities purchased are subject to cost containment activities. A company should look for ways to cap the upward changes in these costs. For example, purchasing agents should be aware of new suppliers for needed goods and services and determine which, if any, of those suppliers can provide needed items in the quantity, quality, and time desired. Comparing costs and finding new sources of supply can increase buying power and reduce costs. If bids are used to select suppliers, the purchasing agent should remember that a bid is merely the first step in negotiating. Although a low bid may eliminate some competition from consideration, additional negotiations between the purchasing agent and the remaining suppliers may reveal a purchase cost even lower than the bid amount, or concessions (such as faster and more reliable delivery) might be obtained. However, purchasing agents must remember that the supplier offering the lowest bid is not necessarily the best supplier to choose. Other factors such as quality, service, and reliability are important. Reduced costs can often be obtained when long-term or single-source contracts are signed. A company may circumvent seasonal cost changes by postponing or advancing purchases of goods and services. However, such purchasing changes should not mean buying irresponsibly or incurring excessive carrying costs. Economic order quantities, safety stock levels, and materials requirements planning as well as the just-in-time philosophy should be considered when making purchases. As to services, employees could repair rather than replace items that have seasonal cost changes. For example, maintenance workers might find that a broken heat pump can be repaired and used for the spring months so that it would not have to be replaced until summer when the purchase cost is lower. Cost containment can prove very effective if it can be implemented. In some instances, although cost containment may not be possible, cost avoidance might be. Cost avoidance means finding acceptable alternatives to high-cost items and/or not spending money for unnecessary goods or services. Avoiding one cost may require that an alternative, lower cost be incurred. Example: Some companies have decided to self-insure for many workers’ compensation claims rather than pay high insurance premiums. Gillette avoids substantial costs by warehousing and shipping Oral-B toothbrushes, Braun coffeemakers, Right Guard deodorant, and Paper Mate ballpoint pens together because all of these products share common distribution channels. Closely related to cost avoidance, cost reduction refers to lowering current costs. Benchmarking is especially important in this area so that companies can become aware of costs that are in excess of what is necessary. Companies may also reduce costs by outsourcing rather than maintaining internal departments. Data processing and the financial and legal functions are prime targets for outsourcing in many companies. Distribution is also becoming a highly viable candidate for outsourcing, because “for many products, distribution costs can be as much as 30% to 40% of a product’s cost”. Consider: Sometimes money must be spent to generate cost savings. Accountants may opt to use videotaped rather than live presentations to reduce the cost of continuing education programs. Some of the larger firms (such as Arthur Andersen) have their own in-house studios and staffs. Although the cost of producing a tape is high, the firms feel the cost is justified because many copies can be made and used in multiple presentations over time by all the offices. Other firms bring in specialists or use satellite or two-way interactive television to provide continuing education to their employees. Another Good Consideration: Cutting staffs to cut costs is putting the cart before the horse. The only way to bring costs down is to restructure the work. This will then result in reducing the number of people needed to do the job, and far more drastically than even the most radical staff cutbacks could possibly do. Indeed, a cost crunch should always be used as an opportunity to re-think and to re-design operations. In fact, sometimes cutting costs by cutting people merely creates other problems. The people who are cut may have been performing a value-added activity; and by eliminating such people, a company may reduce its ability to do necessary and important tasks as well as reduce organizational learning and memory. First, the type of costs incurred by an organization must be understood. Are the costs under consideration fixed or variable, product or period? What cost drivers affect those costs? Does management view the costs as committed or discretionary? 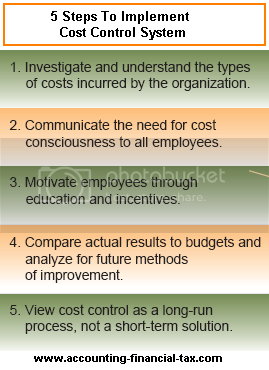 Second, the need for cost consciousness must be communicated to all employees for the control process to be effective. Employees must be aware of which costs need to be better controlled and why cost control is important to both the company and the employees themselves. Third, employees must be educated in cost control techniques, encouraged to provide ideas on how to control costs, and motivated by incentives to embrace the concepts. The incentives may range from simple verbal recognition to monetary rewards to time off with pay. Managers must also be flexible enough to allow for changes from the current method of operation. Fourth, reports must be generated indicating actual results, budget-to-actual comparisons, and variances. These reports must be evaluated by management to determine why costs were or were not controlled in the past. Such analysis may provide insightful information about cost drivers so that the activities causing costs to be incurred may be better controlled in the future. Fifth, the cost control system should be viewed as a long-run process, not a short-run solution. “To be successful, organizations must avoid the illusion of short-term, highly simplified cost-cutting procedures. Instead, they must carefully evaluate proposed solutions to ensure that these are practical, workable, and measure changes based on realities, not illusions”. Following these five steps will provide an atmosphere conducive to controlling costs to the fullest extent possible as well as deriving the most benefit from the costs that are incurred. Costs to be incurred should have been compared to the benefits expected to be achieved before cost incurrence took place. The costs should also have been incorporated into the budgeting system because costs cannot be controlled after they have been incurred. Future costs, on the other hand, may be controlled based on information learned about past costs. Cost control should not cease at the end of a fiscal period or because costs were reduced or controlled during the current period. However, distinct differences exist in the cost control system between committed and discretionary costs.